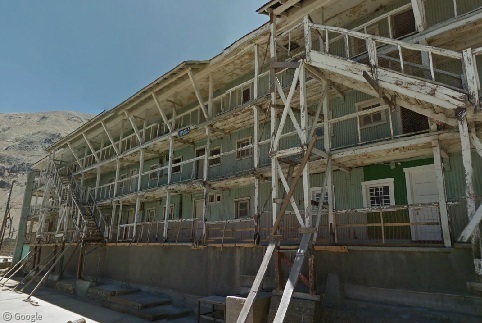 In a country as large and historically rich as Chile, it’s no surprise that ghost towns abound throughout the country. 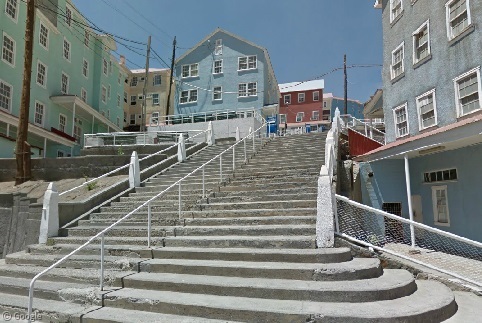 Now with full Street View coverage throughout Chile, it’s time to take a peek at some of these fascinating lost communities. We begin with a more recent entry in the field of (semi-) abandoned cities. 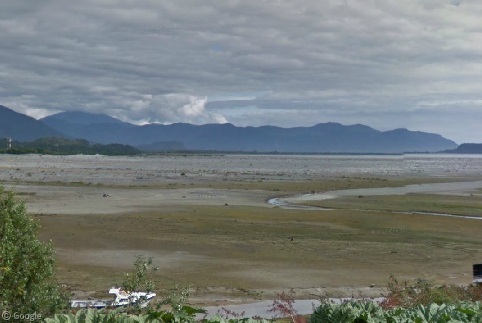 Chaitén was the scenic capital of Palena province, lying on the shores of the Gulf of Corcovado at the foot of the long-dormant Volcán Chaitén. 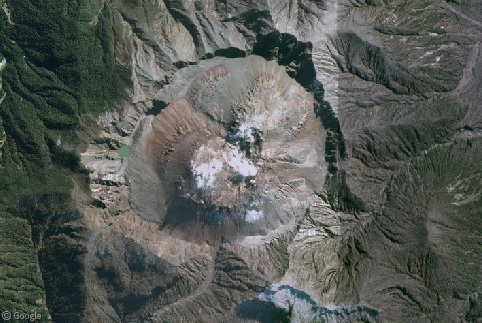 On 2 May 2008, the volcano erupted for the first time in over 9,000 years, and on 12 May a massive lahar1 caused the Blanco River to overflow by 200 m (655 ft) on each side, depositing large amount of muddy debris and leading the river to eventually create a new course that resulted in the destruction of the southern half of the city. 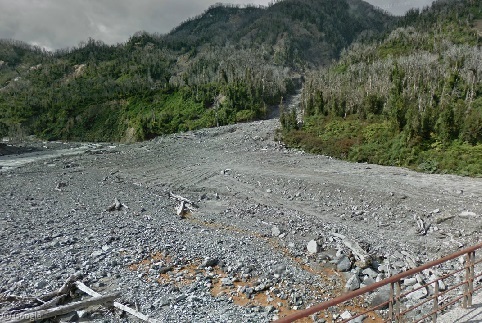 With so much of Chaitén now abandoned, in 2009 the government moved the capital south to Futaleufú and announced plans to rebuild Chaitén 10 km (6 mi) to the north, though the latter plan was eventually scrapped. Though the north side was reopened and is home to over 3,000 people, the south side is still dotted with abandoned buildings and is still being eroded away by the new river course (note the protective rock walls along the river channel). The Blanco’s new course splits the town in half, with the old riverbed seen to the south of Chaitén. 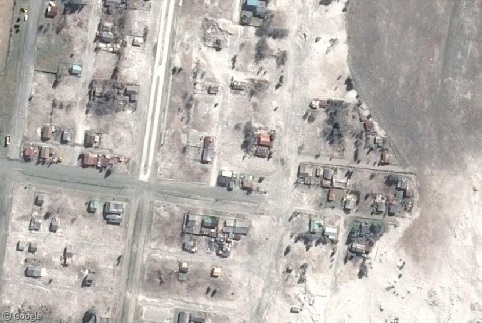 Note the large areas still covered with mud and debris. 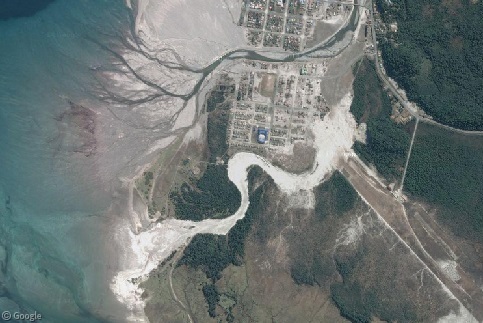 To the west of Chaitén, a new delta is forming in the Gulf of Corcovado. 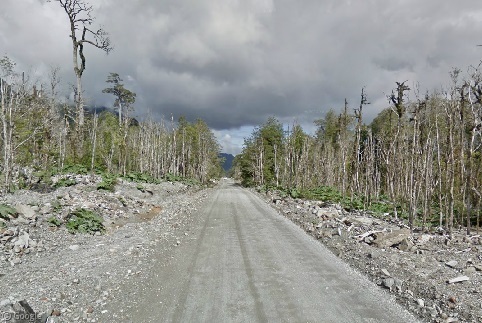 To the north, Route 7, southern Chile’s main artery, runs directly through the paths of the northernmost lahars. 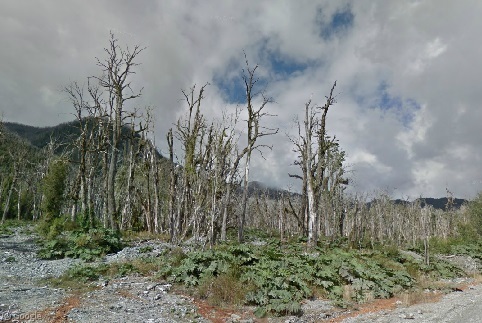 In these Street View images from March 2014, the dead trees and debris left behind by the eruption are still very much evident. 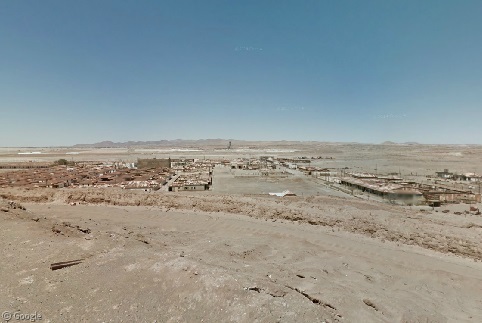 Located 65 km (40 mi) southeast of Santiago, Sewell was a copper-mining city founded high in the Andes in 1904. Not only is the former city notable because of its former size (at its height, Sewell boasted a population of 15,000), its colourfully-painted wooden buildings, and its altitude (2,250 m/7,380 ft above sea level), but because of the methods used to navigate the city. 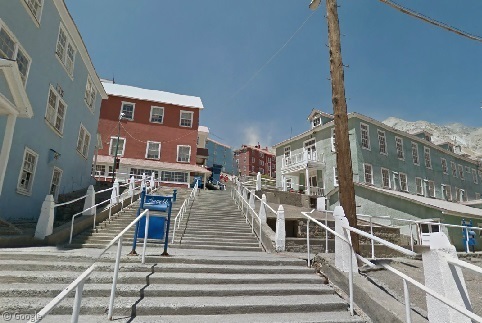 Sewell’s mountainside location was so steep that the entire city was connected not by streets but by stairs. Beginning in the 1960s, the Chilean government slowly began relocating residents to the much larger city of Rancagua, and by 1977 Sewell was closed. While much of the city was demolished under the Pinochet regime, the historical value of Sewell was recognised in the late 1980s and restoration efforts have been ongoing since. 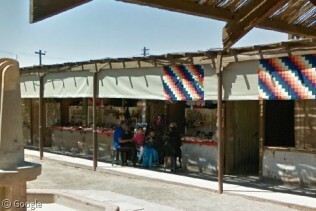 Sewell obtained UNESCO World Heritage Site status in 2006, and guided tours of the city operate regularly. 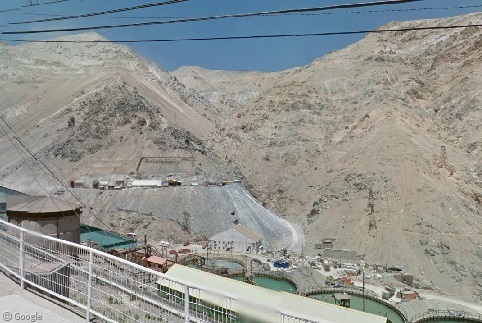 Sewell’s precarious perch brings visitors up-close-and-personal with both the surrounding barren mountains and the copper mine, which remains in operation. The driest place on Earth, Chile’s Atacama Desert is home to approximately 170 ghost towns that owed their existence to sodium nitrate mining. The mines and their associated communities declined rapidly after synthetic ammonia was developed in Germany in the 1910s, and most did not survive the post-WWII era. 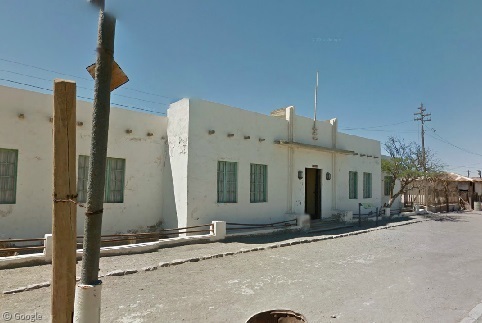 Santa Laura was founded in 1872 in the northern part of the desert 48 km (30 mi) inland from Iquique. 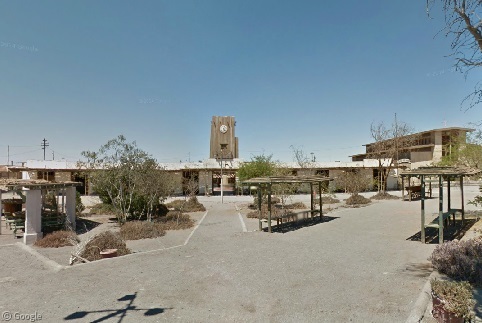 Together with its larger twin, Humberstone, the two towns were abandoned in 1960 and declared national monuments a decade later. 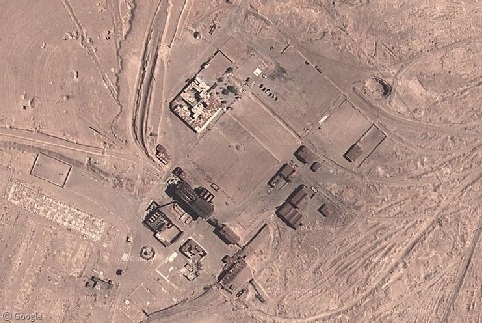 The plant buildings are still readily visible, though they certainly show the signs of exposure and abandonment. At the centre of the old town lies the restored chapel. 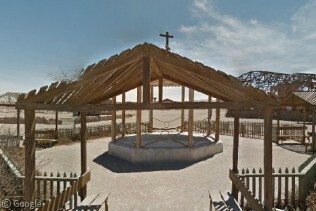 1.5 km (1 mi) east of Santa Laura is the much larger ghost town of Humberstone, also founded in 1872. 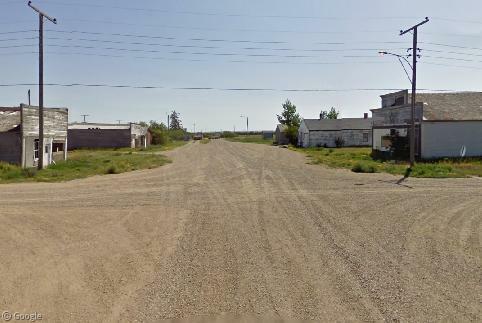 The townsite is seen next to the highway at left, dwarfed by the scars of the once-massive saltpeter operation at right. 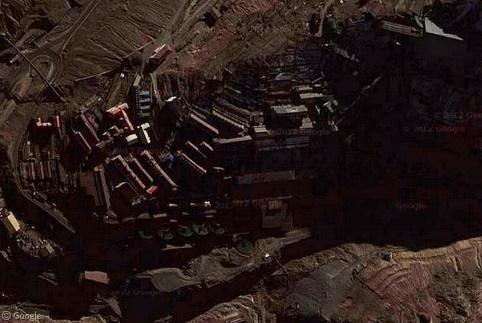 From atop the mine, Humberstone is seen spread across the desert floor with the town square at centre. Not only do the original bunkhouses and barracks remain intact, but the street lamps still line the roads between them. 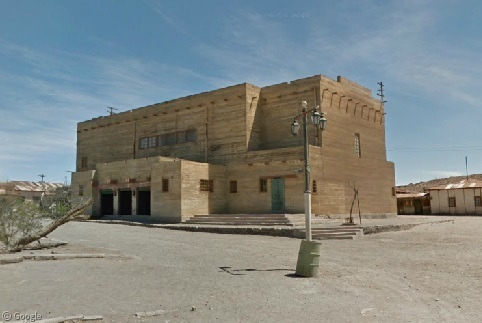 Also preserved at Humberstone are many of the community’s amenities, such as the town square and clock tower, the hotel, and the theatre, whose timber edifice is well-preserved in the dry air. 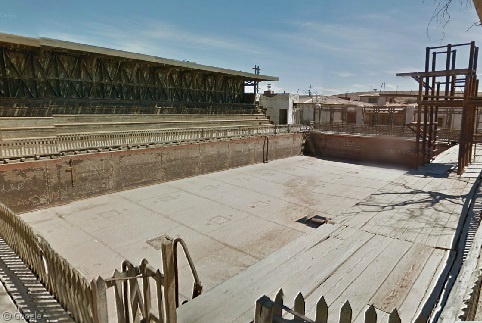 No desert mining community would be complete without a swimming pool (including bleachers for spectators!). Sadly, the refreshing water is not available for modern tourists. 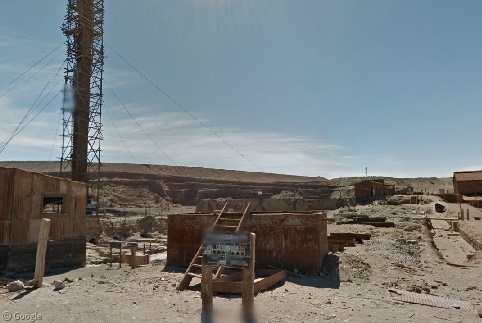 Visitors can view first-hand the abandoned houses and cars blanched by the relentless aridity of the Atacama. 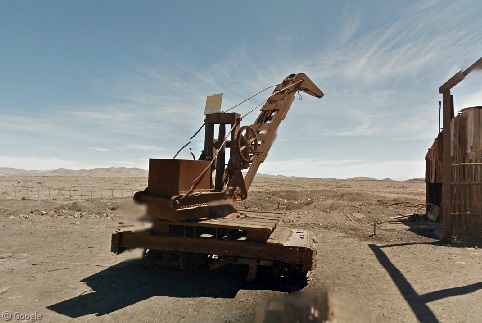 As at Santa Laura, the mining facilities and rusted-out machinery are on full display. 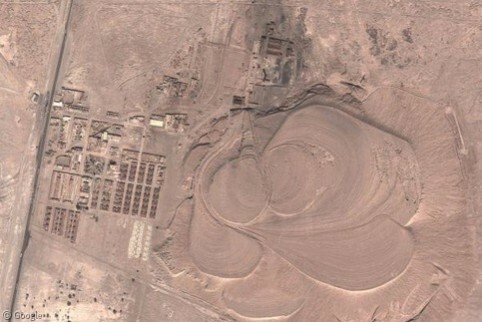 The Humberstone-Santa Laura complex was placed on the UNESCO World Heritage Site list in 2005, but was also added to the List of World Heritage in Danger due to the vulnerability of the structures and threats from earthquakes. And finally, what would a visit to a ghost town be without a trip to the gift shop? 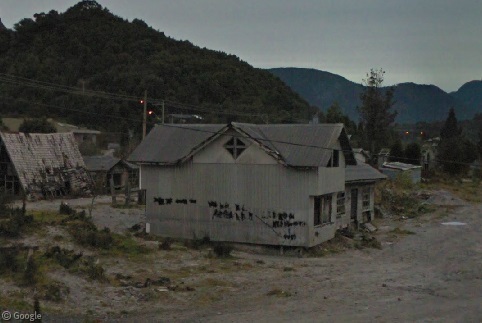 This just scratches the surface of the hundreds of ghost towns throughout Chile. Perhaps one day we’ll be back again to tour some more! 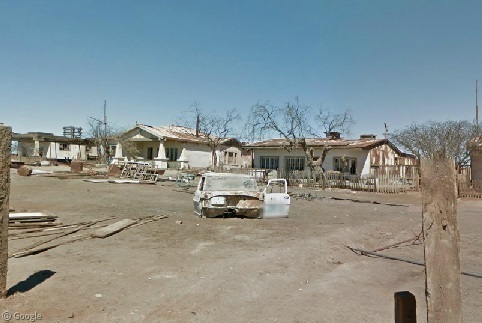 I wish I could visit all the ghost towns of the world on Google Earth. Sadly, the van usually passes them by entirely. I guess it doesn’t help that they’re usually off-road & on private property, locked away behind some gate. Close to Santa Laura is what looks like a big bloody mess. I wonder what all the red stuff is. The van doesn’t pass it.